To make neem oil spray for dogs or any other pets you need 100% pure organic neem oil, the raw, smelly stuff, not a refined oil extract. You could use neem oil extract as well, but it does not work as well. If you want to use the neem for dogs to generally improve the skin health and the coat of your dog, then using neem oil extract is probably fine. If you are hoping to fix some problem, like fleas, ticks, mange or similar, then you have much better chances with raw, unrefined neem oil. Neem oil is no different from other natural substances. The moment you start processing and refining them, they lose a lot of their active ingredients. With that said, lets look at how to make neem oil spray for dogs or cats. The method for making a neem oil spray for dogs is the same as for a plant spray. Only the amounts are different. Always prepare this neem spray freshly, and use it immediately. Once neem oil is dissolved in water it starts breaking down. Keep the solution for no more than eight hours. A 0.5% - 1% solution is strong enough as a repellent spray to protect dogs from mosquitoes, fleas etc. However, if your dog already has a problem with fleas or ticks you can use a stronger solution. You can increase the concentration of this standard solution much higher, up to 10% (just remember that it will also take a lot more soap to dissolve the oil). And instead of spraying you can also sponge it over and through the coat of your dog. Such a strong solution will keep even buffalo flies and sandflies away! But usually it's just not required to waste that much oil. A little neem oil goes a long way. Just mix neem oil into your normal dog shampoo at a rate of 1 to 5 ml for every 100 ml of shampoo, or 0.2 to 1 teaspoon to 4 ounces. Even easier: Simply add a few drops to the shampoo in the palm of your hand. This also prevents any active ingredients in the neem oil from breaking down, which will happen if you mix a larger amount of shampoo and store it. Use less oil if your dog does not have any problems, and more if it does. 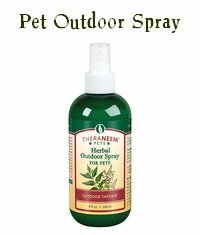 Prevention of problems: you can use this neem oil dog spray whenever you want to protect your dog from biting or sucking insects. You can also use the same spray as a personal insect repellent on yourself. And last but not least you can use the leftovers to spray the dog's bedding, rugs etc. It discourages fleas, mites, mosquitoes, and to some extent ticks. Unfortunately the solution is not stable, you have to make it freshly every time you want to use it. For preventive spraying one of the commercially available neem oil insect repellent sprays for dogs may be a handy solution. You can also get or make a neem dog shampoo, and bathe your dog with that. This will leave a smell of neem oil behind in the coat, enough to discourage annoying pests. Treating problems: if your dog is already struggling with fleas or ticks use the stronger version. Don't expect it to work wonders immediately, especially with ticks! Neem oil does not necessarily kill pests on contact. It works slowly by affecting mostly the eggs and larvae. To treat an existing problem it's best to give the dog a wash first. Use a mild shampoo with a generous amount of neem oil added, work that into the coat and leave it in for a while. Then rinse and use the spray. Do this at least once a fortnight. 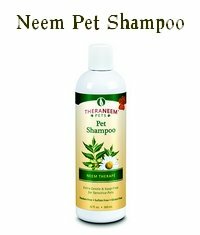 The neem dog shampoo makes sure the neem oil really gets everywhere. It's more effective at reaching the ticks and fleas that are already present. 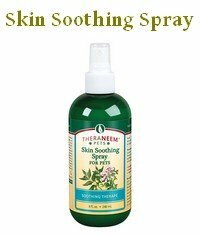 The neem dog spray increases the repellent action of the neem oil, since the shampoo needs to be rinsed out. The spray will hopefully keep additional pests away.